Thanks to robust mechanical construction and categorization in high protection classes (IP 66, IP 67 and IK08), the Quadro-LED-Hi is suitable for indoor and outdoor use. 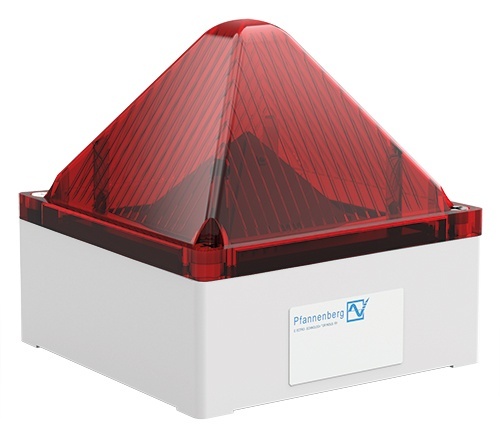 Modular in design and multi-functional, these visual alarms are cost-effective, versatile and powerful signaling solutions. "The Quadro-LED-Hi has everything an industrial light needs: not only a high light intensity but also wide coverage area thanks to its well-thought-out design. Furthermore, it is extremely robust. Neither aggressive environmental conditions nor driving rain, or condensation can effect its performance. With many functions and combination options, industrial companies can cover a wide range of applications with one flexible lighting solution which can be adapted to their requirements," says Carsten Hippler, Signaling Product Sales Manager at Pfannenberg. The luminosity of the Quadro-LED-Hi can be adjusted up to 75 cd. However, luminosity is not a sufficient measure of the effectiveness of a signaling device. The actual coverage area under real environmental conditions is much more decisive and this has been shown for the first time with Pfannenberg's 3D Coverage Approach. This takes account of factors such as the type of alert and the positioning of the device. Users can adjust the operating modes of the LED light at any time within a flexible range of options: continuous blinking frequencies at 1 Hz /2 Hz and flashing frequencies at 0.1Hz / 0.5 Hz / 0.75 Hz / 1 Hz /2 Hz. The Quadro-LED-Hi is even more versatile used with a multi-voltage power pack. There is a 24 V variant with a functional range of 11 V to 60 V (DC) and a 230 V variant with a functional range of 90 V to 253 V (AC) at 50/60 Hz. The lights are also equipped with an inrush current limiter. The Quadro-LED-Hi is designed for ambient temperatures ranging from –40 °F to +130 °F.